The reviews for Cthulhu’s Dark Cults have been coming in thick and fast! All have been positive, too, which is great because I think CDC is one of the great horror anthologies of 2010. … Some mercenaries are hired to provide security at a mine in Peru. One finds out more than is good for his health. This was an action story more than suspense or mystery; as such I liked it but I think the canvas was too broad. First the main character, Max Calder, leads his small band expertly in infantry operations and then he pilots a small plane to attack a ship. After that he is able to use an antiaircraft weapon. OK, this is too much scrutiny for what is actually a fun bit of pulp fiction. The writers in the collection have really captured the true nature of the Cthulhu Mythos and have managed to twist that nature in a new direction. It’s quite the achievement and the collection really does become a must have for lovers of the horror genre. I’m calling this the best Mythos collection since Brian Lumley’s seminal Titus Crow works. … the stories I would highlight as being the pick of the collection (please note chronological order here). John Sunseri’s “The Eternal Chinaman” gets things out of the harbour in style with perhaps a ‘Dagon’ inspired tale of magic versus true evil. Bringing the nasty into things David Witteveen hits us with “Perfect Skin”. Not to be outdone, Shane Jiraiya Cummings tells a cautionary tale of not diving in without first looking as the protagonists learn in the sensational “Requiem for the Burning God“. A touch of the ‘Boys Own Adventure’ was appreciated there. 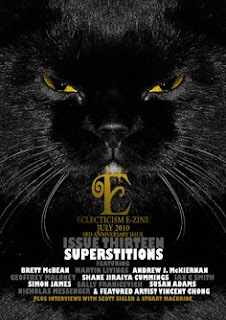 Also over at ScaryMinds is a praiseworthy review of the recently released Eclecticism #13, which contains my story “A Picture of Death”. ScaryMinds is the most exciting and comprehensive addition to the Australian horror criticism landscape since HorrorScope, and it’s a site that’s well worth your time. Check it out! Cthulhu’s Dark Cults can be purchased from Chaosium, and Eclecticism #13 may be downloaded (for free!) from Dark Prints Press.